Dust mite allergy is the most common ‘allergen’ seen in childhood. 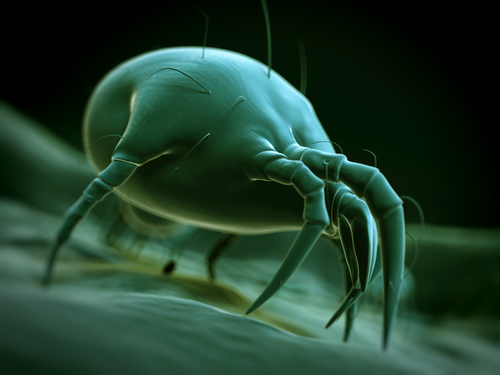 The dust mite lives in bedding, clothes, carpet and soft toys and feeds on skin cells. The faeces and dust mite particles are inhaled or come into contact with the skin. In those people who are allergic this can be a trigger for asthma, eczema, allergic rhinitis (hayfever), and allergic conjunctivitis (itchy eyes). How does this allergy happen ? To be allergic you need to have a genetic tendency. Usually there is a family history of allergies. This tendency means that the immune system, instead of ignoring dust mite as non threatening, will react in an aggressive way. The proteins (allergens) from the dust mite collect in the nose, lungs, eyes or skin. They are detected by antibodies called IgE. These antibodies in turn activate cells just under the surface to release chemicals causing inflammation. This means swelling, redness (blood flow increase), and symptoms such as itch, cough, or increased fluid production (nasal stuffiness). This is where a small amount of allergen is placed just under the skin. If allergic a small swelling like an insect bite will result. This suggests dust mite is one of the factors involved in the allergy. What conditions do Dust mite thrive in ? Dust mite love hot humid still environments, with carpet and fabric in abundance. Vaporisers, soft toys, closed windows, lambs wool underlays, all will increase dust mite numbers. How do I know if eliminating dust mite will help? Generally if dust mite is the only allergic trigger, ie there are no issues with other allergens such as food, cat/dog hair, grass pollens, mold etc, then it is more likely that lessening dust mite will improve symptoms. However if there are lots of allergnes (triggers) then lessening dust mite might not acheive much. Replace draperies with blinds or other wipeable window covering. Replace wool or feathered bedding with synthetic materials that will withstand repeated hot water washing. Use a damp mop or rag to remove dust (a dry cloth just stirs up mite allergens). Vacuum regularly using a cleaner with a HEPA filter or a doublelayered microfilter bag (try not to vacuum when the asthmatic is in the room). Wash and thoroughly dry stuffed toys weekly in hot water, or freeze them weekly. Wash bedding in hot water (at least 50deg celcius weekly). Can dust mite Allergy be cured ? Some sufferers of allergies predominantly react to dust mite. Changing the immune response to dust mite is called desensitisation. Although injectable desensitisation has been used for some decades this is impractical and painful for children. Most allergists in Australia will now use sublingual immunotherapy (SLIT) instead. This involves using drops deposited under the tongue.